Aizawl, Apr 22 : All the district magistrates of Mizoram, sharing international border with Myanmar, have issued prohibitory orders banning import of pigs from the neighboring country where a dangerous swine fever spreading as an epidemic. Dr L B Sailo, Director of the state Animal Husbandry and Veterinary department said that while the endemic classical swine fever in the state was subsiding, especially in Aizawl city, measures must be taken to prevent the entry of 'Porcine Reproductive and Respiratory Syndrome' (PRRS) from Myanmar. "If the PRRS enters Mizoram, it would be much more disastrous than the classical swine fever," Sailo said, adding that import of pigs from neighbouring states, especially those sharing borders with Myanmar was justified. 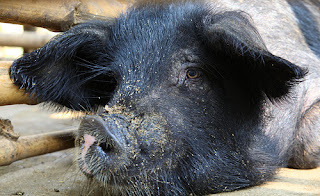 Meanwhile, at least 101 pigs have died in South Mizoram's Lunglei district during the past few weeks due to the classical swine fever which hit at least four district out of the total eight districts of the state. Though pork remained the staple meat of the Mizos, pork sellers were having a hard time as people were reluctant to eat pork while beef, chicken and fish sold like hot cakes replacing the booming pork market due to the prevailing swine fever.